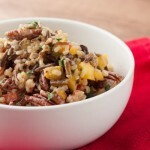 Chilled wild rice salad with pecans and a sweet garlic ginger dressing. Cook both types of rice in separate pots as per package instructions. Drain and set aside to cool. Meanwhile combine dressing ingredients in a blender and blend until emulsified. 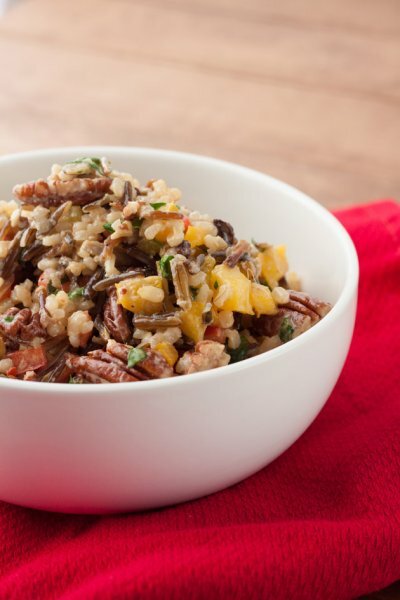 Combine cooled rice with remaining ingredients and pour dressing over top. Stir to coat, cover and place in the fridge to chill for a couple of hours.